If you haven’t been paying attention for the last 81 years of Western cultural history, New York’s Solomon R. Guggenheim Museum is one of the biggest, most popular, and respected art museums in the world. 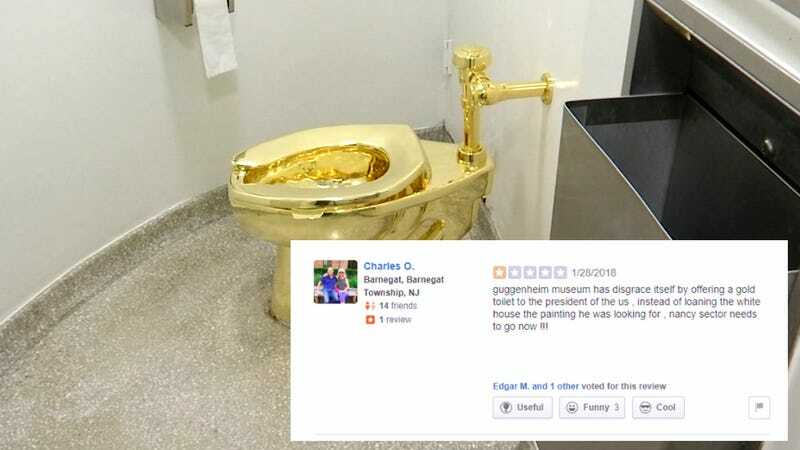 It also recently happened to decline a request from Donald Trump to loan Vincent Van Gogh’s 1888 painting Landscape With Snow to hang in “the personal living quarters of the president and Melania Trump,” per the Huffington Post, and instead offered to lend them a solid gold toilet. So of course supporters of our big boy president decided that they would fight back by bombing the Guggenheim with one-star reviews on Facebook and Yelp over the past week. These folks definitely go to art museums. While Yelp review campaigns have become a headache-inducing reality in the past few years and can hurt small businesses, this is your reminder that yelling at a treasured, world-famous cultural institution about toilets is unlikely to do anything to prevent people from visiting it. It’s like ranting through a megaphone at the Pyramids about Islam or screaming about how the Eiffel Tower is too French while pouring wine into the Seine. If you really want to start a dumb brand controversy over Trump, go smash a Keurig or something.